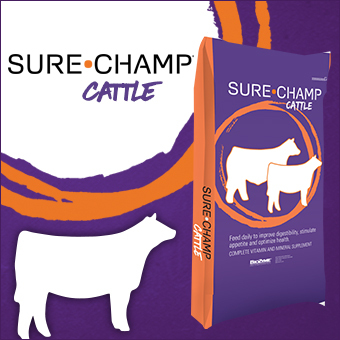 Cattle exhibitors have trusted the Sure Champ® line of supplements for years to add vitamins, minerals and Amaferm® to their show ration. 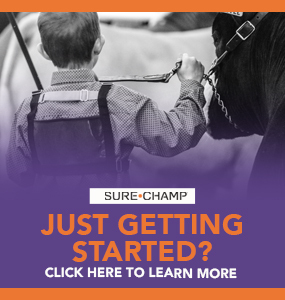 Now, cattle breeders and exhibitors have another way to incorporate Sure Champ into their feeding program by using Sure Champ® Ration Builder to help develop a complete feed for their show cattle. 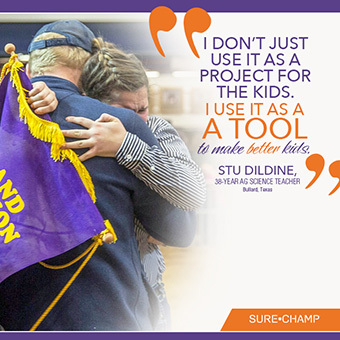 Like the original Sure Champ, Ration Builder is completely fortified and contains Amaferm, a natural prebiotic for digestive health. The difference is it also contains protein so those looking to develop their own rations have all the supplemental nutrients they need from one source. According to Rodgers, Ration Builder contains 32% protein, so end-users can mix their other feedstuffs accordingly to get the desired protein levels while also providing energy to their rations. He said the recommended inclusion rate is 250-450 pounds per ton, depending on the chosen protein level. Kevin Glaubius, Director of Nutrition at BioZyme, said one of the primary advantages of using Ration Builder to develop your own complete feed is knowing exactly what is in each ration. “At high levels of competition, each animal is unique. With developing your own feed and using Ration Builder, you will have the confidence of knowing the ingredients in your feed. With knowing the exact ingredients, you can expect repeatable performance,” Glaubius said. Another benefit of using Ration Builder for your show cattle feed is the ability to add Sure Champ Extreme with Climate Control to the feed at an inclusion rate of 50 pounds per ton for cattle consuming 20 pounds of feed. The Extreme will help to naturally reduce heat stress during the summer and early fall. “We feel the addition of Extreme to your ration will provide many advantages especially for those who market their calf crop in the late summer and early fall when temperatures can still be high, and cattle are affected negatively from heat stress. The opportunity to conveniently add Extreme during these times will allow producers to help reduce stress and maintain normal body temperatures during high traffic periods when buyers are visiting to look at their sale offering,” Rodgers said. The BioZyme nutrition staff has created some example rations using Sure Champ Ration Builder and common feed ingredients. Click Here to download the brochure. Those wanting to discuss custom rations to fit their own scenarios and current ingredient inventory should contact their Area Sales Manager.